Green SuperFood that Supports Thyroid Function! 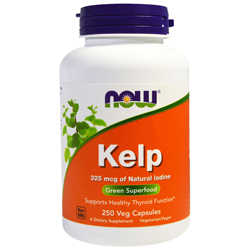 NOW® Foods Kelp Caps contain 325 mcg of natural iodine and 150 mg of dulse to support thyroid function. Kelp is a large, leafy brown algae that belongs to the seaweed family and grows in the colder waters of the world's oceans. It is a good source of marine minerals, including potassium, magnesium, calcium and iron. It is also an excellent source of iodine, which has been shown to support healthy thyroid function. Your thyroid gland is responsible for producing the hormones that support normal cellular metabolism. As with most green foods, kelp also contains vitamins and cell salts essential for good nutrition. Ingredients: (per serving) Iodine - 32 mcg, Kelp (laminaria digitata & ascophyllum nodosum) - 250 mg, Dulse (palmaria palmata) - 150 mg.
Other Ingredients: Cellulose (capsule), Cellulose, Magnesium Stearate (vegetable source) and Silica. Contains no: sugar, salt, starch, yeast, wheat, gluten, corn, soy, milk, egg, shellfish or preservatives. Suggested usage: As a dietary supplement, take 1 Vcap® daily, preferably with meals.